Prizewinner in the Découvertes RFI (radio France Internationale) in 2008, Mikea incarnates this new generation of Malagasy artists which combines with talent tradition and modernity. 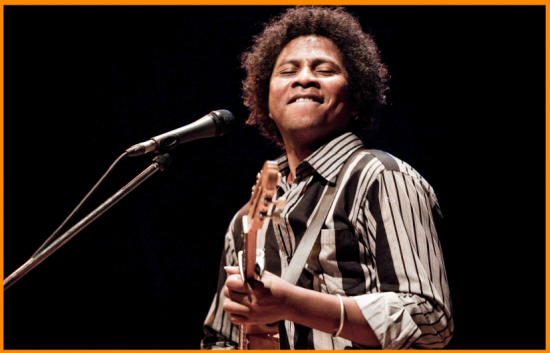 Théo Rakotovao, the leader of the group draws his inspiration in the "Beko", a traditional vocal style in the south of Madagascar. Accompanied by a trio (guitar, bass, drums), Mikea sings loneliness, poverty, exile and home sickness, treason and theft, justice, family and love, but also deforestation and environmental problems. forging links, extending in his own way the reaches of the global village to include compatriots from other regions, all the while flying the flag for the Mikea, whose culture has to date either been ignored altogether or considered tacky. It’s a role he takes seriously on a musical level too, a personal vision of the relation between tradition and modernity resulting from a timehonoured artistic journey. The singing may be rooted in the authentic beko blues of the Mikea people, but the playing and songwriting look further afield, their arrangements and melodies universal. All come together in Hazolava, the song that gives its name to Mikea’s new album. Some of the musicians have flirted with jazz rock, and Théo himself started out in a vein closer to local pop before realising it wasn’t the path he wanted to follow.